Annotation: A visit to the library is an experience that children of all ages enjoy! 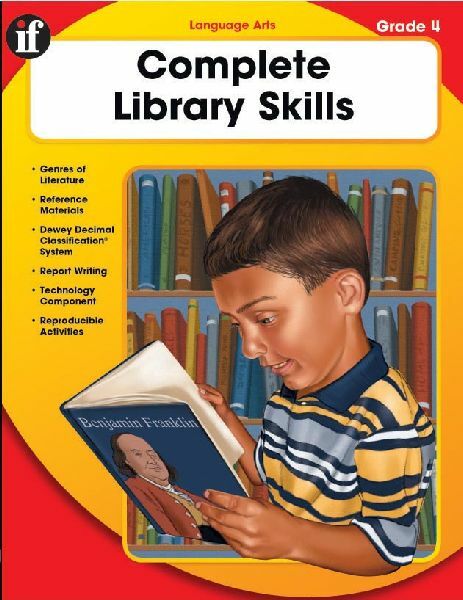 Complete Library Skills provides easy-to-use reproducible activities that leave students excited about the wealth of opportunities available in a library. Help students build essential skills and utilize the growing benefits of technology in libraries. Topics include fiction vs. nonfiction, understanding the card catalog, using reference materials, the basics of the Dewey Decimal Classification System, literary genres, and more. Concepts are presented through fun worksheets and activities, including technology activities, Internet resources and online research activities. Each book also includes 128 reproducible page and a list of grade-appropriate and award-winning literature selections. - Library orientation for school children; United States. - Elementary school libraries; Activity programs; United States.